A strange verse to begin a birth story, right? Welcome to the mystery of the gospel I glimpsed in childbearing. I must begin by saying I don’t think of myself as an advocate for natural birth. If I’m an advocate for anything, it’s for the very thing I advocate day in and day out—personal connection with God. Labor and delivery without medication has offered me the deepest connection with our Lord that I’ve yet to personally experience otherwise on this earth. The intimacy I gained with the Lord through the birth of our daughter satisfied my soul and propelled my heart's desire to gain more through the birth of our son. As the days surrounding the Christmas celebrations closed, my heart turned toward preparing for what would be one of the most intense experiences of my life. With just a couple of weeks before his due date, I buried myself in the Word, savored sweet time with my Harper and husband, and made the final preparations for our son's arrival. The contractions started early. "You're one of the lucky few," my doctor said graciously when I told her that I had been contracting at 28 weeks. Every night after getting my daughter to bed, I'd sit down on the couch and the contractions would start. Slowly at first, but by 32 weeks or so, I had contractions ten minutes apart most nights until I fell asleep. A little over two weeks shy of his due date, on Christmas Eve, I noticed a shift in frequency—6-8 minutes apart—and in time—I started having them during the day, too. These contractions really served to sanctify and prepare me for labor. They were a grace in that way, keeping me from losing focus and indulging any sense of selfishness and walking me slowly down the road towards the real thing. I clung to Romans 12:12, "Be joyful in hope, patient in affliction, faithful in prayer." A week before he came, the contractions turned serious. All through the day, I'd contract, and every night, I'd wonder if he was coming. Since the last two weeks of my previous pregnancy were this way, I followed the instructions one of the nurses had given me: "Try and fall asleep, and if you can't, then you know it's labor." My husband and I walked into the hospital on January 10th around 9pm certain it was labor. I hadn't eaten much all day due to nausea, but the knowledge of his coming, and more so, the knowledge that I would soon experience the Lord in a new and profoundly unique way, filled me with hope. Because I was only 3.5cm, they monitored me for an hour. Strangely, my contractions slowed to 8-10 minutes apart though they had been 5-7 minutes apart since the moment I woke up. I didn't make any changes during that hour, so they gave me the choice—either pack up and go home to labor more or stay here knowing it would be a long labor. We decided we would prefer to go home, but because I was past my due date, the on-call doctor called for an ultrasound. They began monitoring me again while we waited for a tech to come, and as soon as the monitoring began, I contracted consistently at 3.5 minutes apart. As you guessed, we changed our minds about going home but still had to go through with the ultrasound—an intensely uncomfortable thirty minutes of belly jolting in between the super frequent contractions. "I writhed in pain, but I had intermittent relief. Jesus writhed in pain til death. He slept the sleep of death for me. I bore the pain necessary for the deliverance of my son. He bore my grief, my sin, my iniquity to deliver me into the Kingdom of light. Upon me was the discipline of my loving Father to produce holiness in me. Upon Him was the chastisement that brought me ultimate peace. For the joy of being with Him now and forever, I endure." Soon after this, I told my husband I needed him. 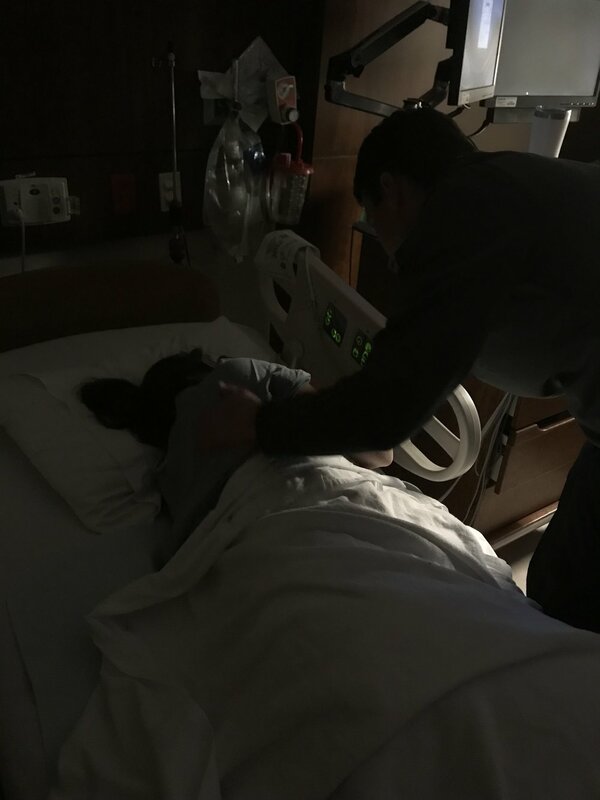 The contractions were getting more painful, and I wanted his nearness and support. He would let me squeeze the life out of his hand while I experienced the pangs of the curse. He encouraged me and did everything I asked to ensure my endurance. I could cry as I remember his faithfulness and kindness towards me through labor. We were forever changed through the labor and delivery of our first, and I knew God had in mind to do the same. My husband is truly my hero. He watched the mystery of the gospel unfold. He thinks he did nothing when I know I couldn't have done it without him. Labor and delivery is one of the most tangible forms of bearing the fullness of something. There is a beginning and an end, an identifiable process and product. Other forms of suffering and weights often lack this tangible quality. We may know what began our grief, but from that point on, we walk about girded by pain, never knowing what exactly will prompt our sadness or even what made us sad that day. We may bear the burdens of others, but even still, in the design of God's good world there remain responsibilities to distract and comforts to relieve. Our sin may weigh upon us heavily, but the experience of faith requires us to lay down what we cannot see, trusting we will receive what we cannot touch—grace and forgiveness. The idea of bearing came alive as I studied Isaiah in the final weeks of childbearing. Upon reading chapter 53, I noticed the words "borne, bear, and bore" right there in one of the most familiar portions of all of Scripture. The people in Isaiah's day were exiled from their land due to their blatant idolatry, their arrogance, and their unwillingness to repent and return to the Lord. Rather than cutting them off completely, God intended to do a far more glorious thing—a thing that would result in unending worship, unceasing awe, and unmerited reward. God, being both merciful and just, restrained His anger towards His sinful people, and for the sake of His praise and desire to dwell with those people, laid upon Christ the wrath His holiness requires against sin. The Substitute. The One who bore the wrath intended for us. The One who bore our grief, our sin, our iniquity. The perfect, obedient Servant. Jesus delivered us from the domain of darkness and transferred us into His Kingdom, to be with Him forever because He bore, and we did not. "Sing, O barren one, who did not bear…"
The punishment for our sins has been borne by Another. Labor afforded me the privilege of knowing Christ intimately in this way. Of bearing the pangs of the curse to deliver my child. Of bearing on behalf of another. Of being unable to escape the all-encompassing experience of bearing. At about 5:30am, the nurse reported good news: I was at 7cm and she could feel my water bag. This gave me a bit of renewed energy, and I began to ask God to "let waters break forth in the wilderness" (a paraphrase of so many of the promises in Isaiah). It would be another hour and a half before He answered, and during that time the reality set in that I know deep in my being to be true but don't always embrace: "God, I cannot do this; You must." The lights turned on for Shift Change at 7am, and while the cheery nurses introduced themselves at the height of my contractions, my water broke. The hustle and bustle of introduction and set-up went on for about ten or fifteen minutes before the on-call doctor arrived, at which point, I felt the urge to push. She offered to check me, but as soon as she turned me over, his head crowned. The nurse held him in until the doctor put her gloves on! I heard, "Here, let's lift up her legs," because the table with stirrups had not yet arrived. And when they lifted up my legs, I pushed one big time, and he arrived. I breathed, this time with the deep feeling of rest. It was finished. *ps. if you missed the story behind his name, you can read about it here.